Ramya comes from a very poor family. Her father is a day laborer and some days, there isn't any work for him to do. Ramya's parents struggle to provide for her and her sister. Sadly, the family's home recently burned to the ground and they lost everything. The wonderful donors of India Partners raised money to build the family a new home and help furnish it. 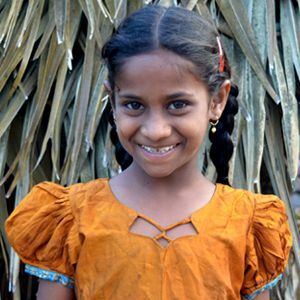 Your sponsorship will allow her to receive a good education as well as much needed food and clothing as well as help relieve Ramya's stuggling parents.